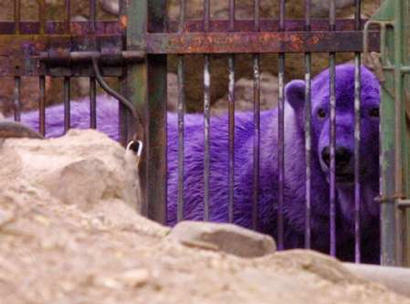 According to various news sources, Pelusa, a female polar bear at the Mendoza Zoo in Argentina, turned purple after being treated with Gentian Violet for a skin infection. Gentian Violet is an antifungal medication commonly used to treat thrush and yeast infections. 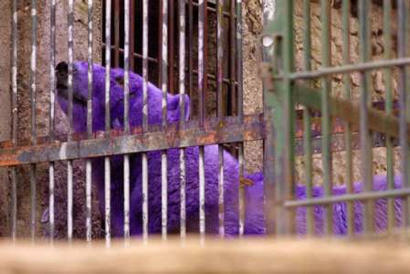 It's also the dye used in fingerprinting. 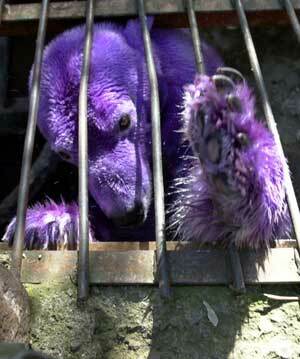 The bear is being kept in an isolation cage for treatment. The coloring will wash off when she is released and begins swimming again. Polar bears have clear hair shafts which appear white because they reflect light. a result of Singapore's warm and humid climate. Sheba's coat was successfully bleached with hydrogen peroxide 2 1/2 weeks ago and Inuka will be given a similar treatment in 3 weeks, giving the zoo time to observe Sheba's reaction to the treatment. For now, Inuka remains mottled with bright grass-colored splotches behind his ears, on his back and on his legs. 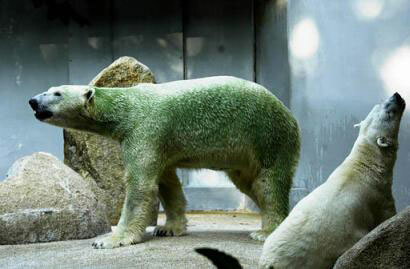 Three polar bears at the San Diego Zoo developed similarly green coats in 1979 but were cured with a salt solution, according to the Web site of Polar Bears International.